Emmy, Tony, Grammy, and Oscar winner Rita Moreno turns 82 today, December 11, 2013. And what a great excuse to post a clip of her wonderful performance of “America” in West Side Story. It’s a classic. No wonder she won an Academy Award for this role. When I was a kid, a playmate and I used to play the record of this song and jump around on the furniture until we were out of breath. Go ahead and try it — it makes the song even more enjoyable! 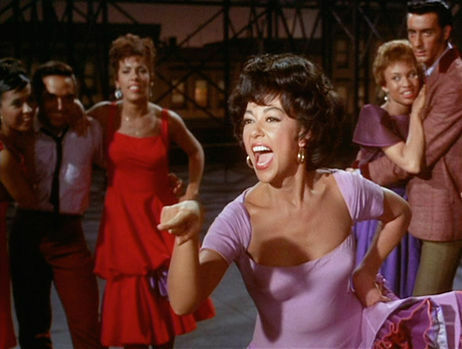 For many people my age, our first exposure to Rita Moreno was on The Electric Company, a PBS series produced by the Children’s Television Workshop. Moreno won her Grammy in 1972 for her contribution to The Electric Company Album. Below, Rita Moreno and Morgan Freeman perform Tom Lehrer’s “The Menu Song” on The Electric Company. You’ve got to watch it; it’s fantastic. Is he a scarecrow? A sharecropper? Somewhere near a diner, I guess.